If they threw it to a bird…the bird’s neck got stuck in the three prongs. Kayak hunters carried darts for catching seabirds, and threw them with the aid of a board. The weapon has a serrated bone point for striking birds and side prongs to hook their necks and wings. Red paint made from volcanic minerals and blood was used to color hunting weapons, as seen on the shaft of this dart, because the color was believed to attract game. 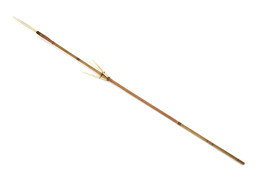 Dart shafts were made of cedar wood, which drifts ashore in the islands, because it is very light but strong. Vlass Shabolin: This is for fish … because when you get your fish it won’t come loose with these three [prongs] inside the body. It’s just like a gaff hook. . . You’ve got marks on the inside there to show you where it’ll stop from going down. What they actually do with this one here is spear the fish and then when it gets [to the marks], then they lift it up, turn it over and drop the salmon on the beach.